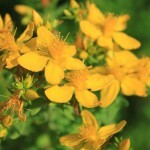 Many herbs and flowers are associated with Summer Solstice, but the most famous is St. John’s Wort. The ancient Celts believed St. John’s Wort protected against evil, and ran it through the Midsummer’s Eve fires. Because it flowers near the Summer Solstice, it has been associated with the pagan holiday of Litha for centuries. It has been hung above doors for centuries to protect the home and its inhabitants against ill will. It is said to prevent nightmares if hung above the bed. Early Christians named the flower in honor of John the Baptist, whose feast day is June 24. It has been used by witches for centuries as protection against evil, and then was used in the Middle Ages by Christians to help them discover witches. St. John’s Wort loves partial sun, and likes room to grow (it can reach three feet). Harvest when the flowers are in full bloom. Hang the cuttings upside down in a cool, dry, dark place to dry. Lovely! I’ve never grown St Johns Wort! My herb garden just keeps getting bigger and bigger…I found a whole flat of Rue in the oddest place yesterday…I guess it was meant for me!